Soft robotics is becoming an emerging frontier in scientific research and engineering innovation due to its safe and adaptive interaction with human and environment. Compared to rigid links in traditional rigid robots, soft robots are often made of highly deformable soft materials, thus allowing extreme compliance, endurability, elasticity, and theoretically infinite number of degrees of freedom, which are not possessed by rigid robots. However, soft robots often exert small force and exhibit slow response due to the compliance of their soft bodies, which largely limit their functionality as high-performance soft robots. In this talk, I will explore leveraging elasticity and elastic instability in structures and soft materials for designing high-performance soft robots in terms of high force, high speed, and multifunctionality. First, I will discuss the design and demonstration of environment-adaptive programmable kirigami machines by harnessing folding and cutting in simple kirigami structures. Next, I will talk about our recent work in mechanics guided design of two fundamental doming and bending soft actuators, as well as their integration for design of bio-inspired energy-efficient soft machines, including doming actuator-based amphibious soft climbing robots, and bistable bending actuator-based multifunctional high-speed locomotive soft robots both on land and under water. Future research work will be discussed in the end. Dr. Jie Yin is currently an Assistant Professor in the Mechanical Engineering Department at Temple University, Philadelphia. He joined Temple in 2013 Fall. Prior to Temple, he was a postdoctoral associate at MIT. Dr. Yin received his Ph.D. in Engineering Mechanics at Columbia University in 2010, and M.S. in Solid Mechanics at Tsinghua University in 2007. 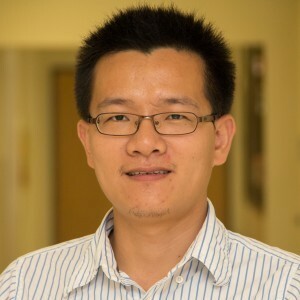 Dr. Yin is the recipient of the 2017 Extreme Mechanics Letter (EML) Young Investigator Award. His group’s current research focuses on soft robotics, mechanics and design of mechanical metamaterials, and multifunctional materials.